The inspirational reality beauty makeover pageant shown Saturdays, 10:30 a.m. at Studio 23 has named the last five contestants who will battle it out for the top prize in "Gusto Kong Maging Beauty Queen" (GKMBQ): Air Paz, Japo Parcero, Darlene Anderson, Karen Navarro, and Gillien Camino. “On August 24, we will crown the winner - the ‘most beautiful contestant’ who after workshops and challenges was able to discover and showcase her full potential and improve herself, worthy of being called a beauty queen,” Charo adds. Most of you are probably familiar with Kikomachine Komix! This comic strip showcases the everyday life of a typical Pinoy, featuring themes that are very common and relatable such as commuting, dating, college life and more. What makes Kikomachine hilarious is that they are presented in an exaggerated manner, highlighting Pinoy trademark qualities as it goes along. Now, Solo's back with another exciting collection for its 4th year of Pinoy Cartoonist Memorabilia! This time, Manix Abrera has joined the wave of well-acclaimed cartoon artists we pay homage to for Solo's upcoming comic based collection. Following the success of the first three highly praised collections comes Manix’s Kikomachine, a hilarious comic depicting an average Pinoy’s everyday lifestyle and experiences, featuring a bunch of nameless University kids as main characters. The collection consists of men and women’s casual wear composing of tees, collared tops and shorts, all decked with graphic images of humorously drawn characters and eccentric comic strip scenes from Kikomachine. It won’t matter if you’re already an avid reader of Kikomachine or if you’re just starting to get familiar with it because the collection’s prints are eye-catching and fun, definitely something that everyone can enjoy! Wear them anywhere for that casual, upbeat look and put that Pinoy humor in fashion. Get set for another whimsical and trendy fashion break as Manix Abrera’s Kikomachine collection is set to hit Solo stores this August! Ever dream of becoming a model, but too shy and intimidated to go through all those go-see's? This is your chance! Solo, being a front runner of innovative ideas, invites you to its SOLO ONLINE MODEL SEARCH 2013. The coveted modeling competition started back in 2009 and has been successful ever since. Yearly, close to 100 model poster entries are submitted to Solo's site , which allows viewers to vote for their fave model. The 2012 grand winners, Ganiel Krishnan and Derek Espinosa, both had the chance to play out their modeling dreams with last year’s Online Model Search featuring Tonton Young’s Pupung. Past featured collections include Tony Velasquez’s Kenkoy, Larry Alcala’s Slice of Life. Solo's Online Model Search is ingeniously launched with its Pinoy Cartoonist Memorabilia Series as contestants are tasked to wear one item from the featured collection and model it in their photo entries. Past featured collections include Tony Velasquez’s Kenkoy, Larry Alcala’s Slice of Life and Tonton Young’s Pupung. This year, it’s all about Manix Abrera’s Kikomachine. Men and women’s apparel ranging from t-shirts, collared tees and shorts are all dawned with graphic images of Kikomachine’s trademark cartoons and beloved characters. Running on its 5th year, Solo's much-anticipated modeling competition starts on August 15. Contestants, male or female, should submit photo entries of themselves modeling one (1) item from Solo’s Pinoy Cartoonist Memorabilia Series featuring Manix Abrera’s Kikomachine while adhering to the theme: Street Life. 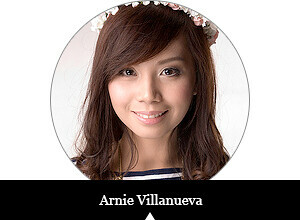 Photo entries must also include at least one of the design elements found in the design pack which contestants can download at solo.com.ph. Do you think you have what it takes to be the next face of Solo? Then let your inner model shine and join Solo's Online Model Search 2013! For complete mechanics, log on to Solo's website or like their Facebook page. Follow them on Twitter and Instagram, too, @MySoloOnline. Listen up, girls! It's finally our turn to shine this month with the Fashion Authority! 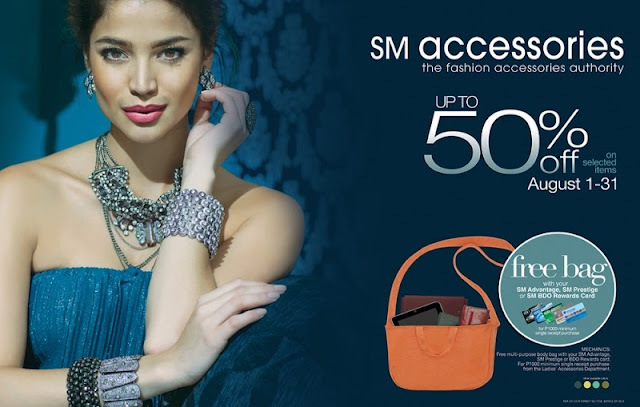 With your fashionista BFFs, raid the nearest SM Store near you for SM Accessories' huge sale! Visit their Facebook page for updates and more info! 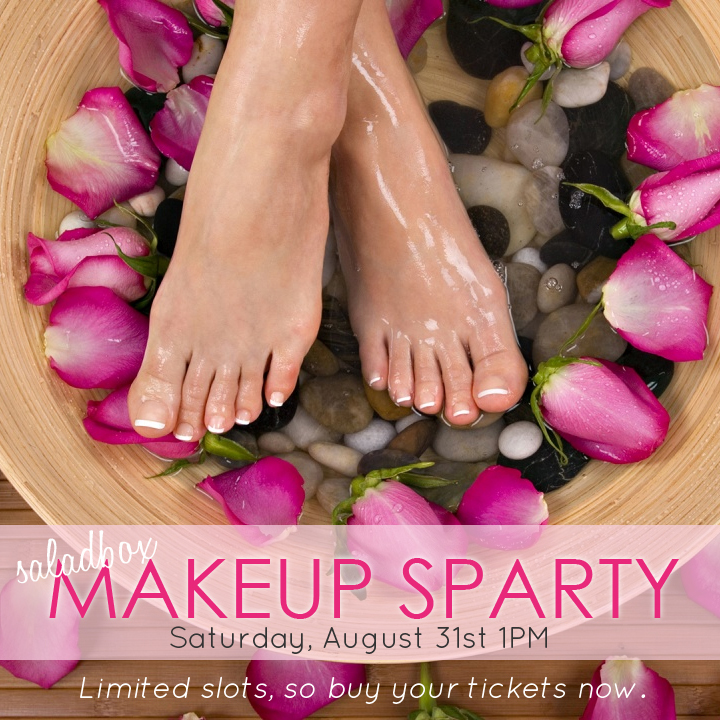 Saladbox Makeup Sparty: Learn and Relax! Mark your calendars! 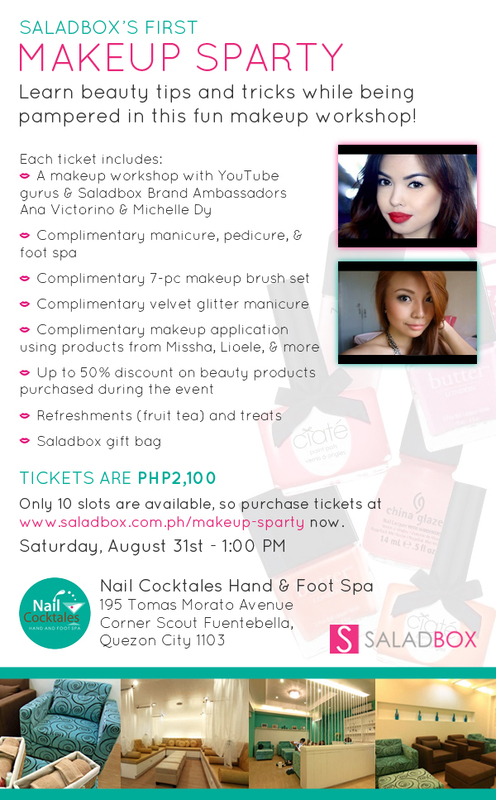 This August 31, Saladbox will be having its very first Makeup Sparty (makeup workshop slash spa party) with YouTube makeup gurus Ana Victorino and Michelle Dy! More details about this event here. 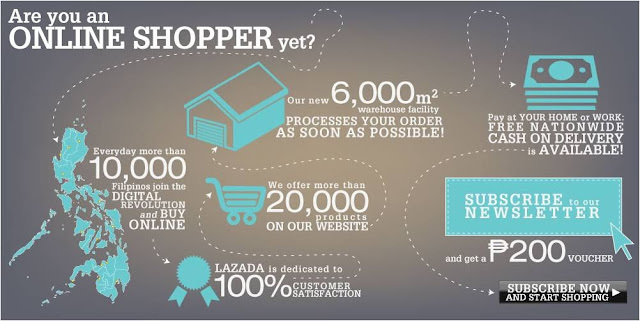 Filipinos are taking over the online shopping scene in Asia! According to an online consumption study conducted by Nielsen, Filipinos are among Asia-Pacific's most active online shoppers. That's not all there is to know about online shopping in the Philippines. Filipinos are reportedly the most savvy at filling up their virtual shopping carts, as 72% of Filipinos use the Internet for product research - bagging the title of being the most active bargain-seekers in Asia, with the exponentially increasing internet penetration in the country. Not only that, but attractive deals, promos, and regular flash sales pique the interest of Filipino shoppers online, appealing to the “bargain-hunter” mindset.